Cruise Milford Sound from Te Anau during a full-day tour to UNESCO-listed Fiordland National Park. You’ll access this crown jewel of New Zealand’s South Island by luxury coach, stopping en route at the Mirror Lakes before boarding a 1-hour 45-minute cruise on luxurious catamaran journey past waterfalls and steep-walled pinnacles such as famous Mitre Peak. View Mitre Peak, located at the pinnacle of the sound. It rises dramatically from the depths to a height of 1,692 metres above sea level. Suba a bordo de su autobús panorámico en Te Anau, conocido como "Gateway to Fiordland". 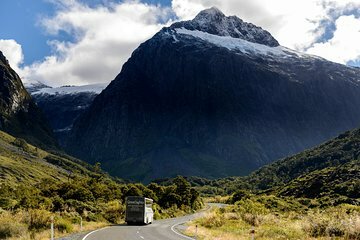 Su excursión de un día completo incluye un majestuoso crucero Milford Sound de 1,5 horas dentro del Parque Nacional Fiordland, declarado Patrimonio de la Humanidad por la UNESCO. De camino al fiordo, su guía de conductor pasa por el antiguo bosque de hayas del valle de Eglington, deteniéndose en Mirror Lakes para un tramo de piernas y una sesión fotográfica. Continuando por Upper Hollyford Valley, serás hipnotizado por Christie Falls antes de ingresar al túnel de Homer, perforado a través de la sólida roca de montaña. Prepárate para la grandeza del valle de Cleddau, donde seguirás un puente peatonal sobre el río Cleddau hasta el Chasm para ver los turbulentos remolinos del río antes de descender a Milford Sound. Desde su barco de crucero, disfrute del esplendor de su entorno mientras pasa por las cascadas que caen verticalmente en las paredes de roca tallada por el glaciar. Escuche comentarios sobre maravillas naturales como el pico de Mitre, perfecto para una postal, que se eleva a 5,551 pies (1,692 metros) del agua. No se pierda la vida salvaje, como los lobos marinos de Nueva Zelanda, los delfines mulares y el raro pingüino de Fiordland. Se incluye un almuerzo buffet gourmet a bordo del crucero, antes de volver a abordar a su entrenador para el viaje de regreso a Te Anau. Fantastic day trip. Even though it rained the benefit was the extra waterfalls created on the mountains. Great day trip, but the weather was not good. Enjoyed the stop at mirror lake and the falls. Our trip was spoilt as the coach driver/tour guide picked us up in Te Anau with an already coach load from Queenstown, and forgot to give us our boat tokens. We were therefore refused entry onto the boat for our cruise and had to track him down to assist. We did manage to go on a different much larger boat, not what we had booked. The buffet on the boat was ok but nothing special. Awesome tour. Coach trip to Milford was most interesting with great stops. Boat was clean and spacious and easy to move around. Lunch on board delicious. Milford Sound was beyond awesome. A wonderful day out. An excellent trip made even better by Greg the coach driver who gave us so much information about the area and who took the trouble to find parking spots where other coaches didnt stop so that we could see extra views. The boat was very smooth and the buffet lunch was tasty. Again the captain gave us plenty of information so that we could appreciate the magnificent scenery. Luckily for us the weather was perfect so the whole day was a wonderful experience. Trip is good, although partially spoiled by the rain. Lunch on the cruise was not good--it was a very disorganized buffet , with bits of unidentifiable food everywhere. Run and get your food before it disappears! Better to hand everyone a sandwich. Bus driver was engaging and told a few interesting anecdotes. He shouldn't let his frustration with other drivers make it's way over the intercom. Bus was very comfortable and driver stopped, as necessary, for our comfort. The coach driver was fantastic, the road is difficult, the views are incredible, it will always stay in our mind how beautiful the nature can be and how blessed we are to be able to see these wonderful places.the company is Great Sights and took us a while to find as we had to contact them to pick us from the hotel.